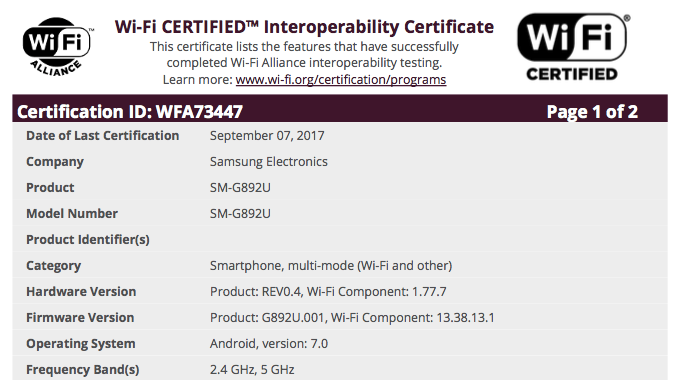 A new Samsung smartphone has been certified by the WiFi Alliance (WFA). The listing reveals the device carries a model number of SM-G892U, and runs Android 7.0 Nougat out of the box. The model number (SM-G892U) is similar to the one that the existing Samsung Galaxy S8 Active carries (SM-G892A). So it's quite possible Samsung is preparing to launch a new variant of the S8 Active. The 'U' towards the end of the model number further hints that the SM-G892U could possibly be the unlocked global Galaxy S8 Active model - the initial S8 Active, as has always been the case with Galaxy S Active series phones, is AT&T exclusive. Sadly, there's currently no official information available about the SM-G892U, so there's more waiting to be done until we get the full picture. Apparently this is the first Phone with Bluetooth 5.1 .